Entra in contatto con l'eredità coloniale del Perù durante questo tour guidato di 3 ore a piedi di Arequipa. Passeggia per le strade della seconda città più grande del paese, ammirando gli edifici bugnati (roccia bianca vulcanica) del suo centro storico dichiarato Patrimonio dell'Umanità dall'UNESCO. 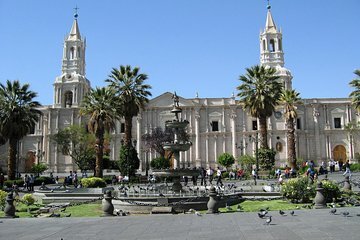 Mentre cammini, visiterai il quartiere più antico della città, vedi la prima chiesa di Arequipa, gioca con alcuni lama e alpaca e assaggia alcune patate, uno degli snack più tipici del Perù. Una guida, pick-up in hotel e degustazione di cibo sono inclusi. This tour to begin with was a 100 FREE tour, which was even offered to us by our Hotel. The guide took us to the meeting point where she had her very large sign saying FREE and was touting for more business before we left. In her introduction she advised was FREE and if wanted to tip then that was up to us. As for the tour itself an awful lot of walking, not recommended for anyone older or not fit, the information itself was quite limited, the finale to the tour was a long walk up a steep hill to a view point that was pretty poor to say the least. We will of course be taking this up directly with Viator, it may not be their fault, we may have simply been palmed off between tour reps but still a pretty poor tour.